Monster Energy Presents the Official Rock on the Range Pre Party at The Bluestone featuring Paradise Kitty with Special Guests Brandon & Dan of Atreyu and Cadaver Dogs. David Nail will perform live at The Bluestone on Friday, July 20th, 2018! Tickets On-Sale June, 8th 2018 at 10AM! A country artist with an agile voice, a gift for songwriting, and a passionate performing style, David Nail was born in Kennett, Missouri on May 18, 1979. Music was a major part of the Nail household — his father was a high school band director proficient on a number of instruments, and his mother sang in the church choir. His parents had an extensive and eclectic record collection, but country music wasn’t on Nail’s radar until he was 14 and attended a school talent show. One of the entrants sang a version of Travis Tritt’s “Anymore,” and Nail was so taken with the song he immediately asked his folks to buy him a copy of Tritt’s recording. In high school, Nail sang in the school’s choir, appeared in local talent shows, and began writing songs, but he was also a fine baseball player with a .385 batting average, and he was accepted at Aquinas College on a sports scholarship. However, a shoulder injury ended his baseball career during his first college season, and Nail returned home to sort out his options. He resumed his education at Arkansas State University, but when he was 20, he spent a few days in Nashville and was inspired to take another shot at a career in music. He moved to Music City, concentrated on his songwriting, and was playing a few songs at a party when, as luck would have it, he was heard by the daughter of record producer Keith Stegall. She told her father that Nail was a talent worth hearing, and before long the singer and songwriter was signed to a contract with Mercury Records. In 2002, Nail released his first single, “Memphis,” but while the tune made it onto the Country Singles charts, Mercury opted not to release the album he recorded for them, and he was soon without a record deal. After a few years of coaching baseball, Nail took another shot at Nashville, and once again found a champion in the form of a record producer, this time Frank Liddell. Liddell helped Nail score a new deal with MCA Nashville, and in 2008, Nail’s first MCA single, “I’m About to Come Alive,” was released. It fared slightly better than “Memphis,” but it was his next release that changed the game for Nail. Released in February 2009, “Red Light” peaked at number seven on the country singles charts and earned Nail a gold record. 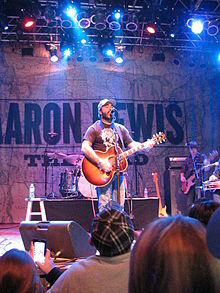 The success of the single led to Nail cutting an album for MCA, and this time, 2009’s I’m About to Come Alive was deemed worthy of release, rising to number 19 on the country album charts. In February 2011, Nail released “Let It Rain,” which became his first tune to become a number one country single; the album The Sound of a Million Dreams followed several months later, and reached the Top Ten of the Country Albums chart. 2012 saw the release of a three-song EP, 1979, which included a cover of Adele’s “Someone Like You.” 2013 brought Nail another massive hit single, “Whatever She’s Got,” which earned him a platinum sales award. It was the first single released from Nail’s third MCA album, 2014’s I’m a Fire, which reached number three on the country album listings. Muscadine Bloodline LIVE at The Bluestone on September 28th, 2018! Hailing from Mobile, Alabama and based in Nashville, Tennessee, the contemporary country duo Muscadine Bloodline certainly sounds southern but they don’t necessarily seem beholden to either hometown. At times, the pair of Charlie Muncaster and Gary Stanton can recall the plainspoken sound of Texas Red Dirt country; sometimes they kick up a bit of Southern rock, and sometimes they have the polished songcraft synonymous with the Music City. All of this is evident on their eponymous 2017 debut EP. Corey Smith LIVE at The Bluestone on October 4th, 2018! Tickets On-Sale August, 3rd 2018 at 10AM! Corey Smith, the fan-made man, has sold over 1 million concert tickets, 1.5 million digital singles and over 220,000 albums. Corey Smith has amassed an unfailingly devout fan base, not only in his native Southeast region, but all around the nation, simply by telling it the way it is. He has released 10 albums—including 2011’s Top 20 release The Broken Record. Corey Smith has written every word on every album himself and he produced 9 out of 10 of the records. In Summer 2015, Corey Smith teamed up with producer Keith Stegall (Alan Jackson, Zac Brown Band) for his album, “While the Gettin’ Is Good,” which was released on Sugar Hill Records. Smith’s concerts, which were documented on his last live record, Live in Chattanooga, regularly sell out, with audiences singing along to such fan favorites as the coming-of-age anthem “Twenty-One,” the nostalgic time warp “If I Could Do It Again” and the group hug “I Love Everyone.” Corey consistently tours, hitting around 120 dates per year and has begun releasing singles from his upcoming project, the Great Wide Underground. Lettuce LIVE at The Bluestone on Friday, October 5th, 2018! Tickets On-Sale Friday, August 10th @ 10:00AM! Thank you for purchasing Lettuce tickets. 2. Please print out your Print-at-Home tickets. They will be scanned at the front entrance of the festival. Tickets are transferable from person to person. 3. In the event that the festival is either cancelled or postponed, we will make every effort to contact every patron via e-mail, time permitting. While we regret the inconvenience caused by these circumstances, we cannot be held responsible for any cost or damage such postponement or cancellation may incur. 4. The holder of the ticket assumes all risks and danger pertaining to the event for which the ticket is issued. CincyTicket, the venues, and the event organizers cannot be held responsible or liable for injuries, loss or damages incurred by patrons while attending these events. 5. All patrons purchasing tickets must do so in the light of the above limitations. 6. Refunds on tickets purchased are only made for an event that has been cancelled entirely. Times, dates, locations, performers, and event details are all subject to change. In all instances when a ticket is refunded, only the cost of the ticket is refunded, not the service fees or order processing fees. Armin Van Buuren at The Bluestone on Wednesday, October 10th, 2018! Armin van Buuren is widely regarded as one of the world’s biggest DJs and producers within Electronic Dance Music for a whopping twenty years. His life-long dedication to Electronic Music has earned him a Grammy® nomination for ‘This Is What It Feels Like’ (feat. Trevor Guthrie) and he has been voted “#1 DJ” in the world for an unprecedented five times in the annual DJ Mag Top 100, not to mention the fifteen consecutive top 5 spots to date. His weekly two-hour radio show, “A State of Trance” (ASOT), is broadcast weekly in more than 84 countries, drawing more than 37 million listeners every week. The ASOT brand has grown into a complete live show experience and touring concept, with stages and events all over the world. The next event series of A State Of Trance, A State Of Trance 800, is to kick off in Utrecht, the Netherlands on February 18th, 2017. In the same month (February, 2017), Armin van Buuren is to open a brand-new radio studio in the HQ of Armada Music in Amsterdam, from which the A State Of Trance episodes are to be broadcast live. The Big Bad Blues Tour: Billy F. Gibbons Featuring Matt Sorum and Austin Hanks. Billy Gibbons had plenty of help getting the blues for his upcoming second solo album, The Big Bad Blues; both from his assortment of musical collaborators and, on the track “Missin’ Yo’ Kissin’,” from Gilligan Stillwater, the woman he affectionately (and legally) calls Miz Gibbons. “That was a gift,” the ZZ Top mainstay tells Billboard about the track, whose lyric video premieres exclusively below. “We had gotten maybe five (songs) recorded, and my lovely sweetheart Gilligan was scribbling away on the couch. I was, ‘Omigod, she’s reading the Chanel catalog. Hide the credit card!’ Then she took a break and the engineers kinda glanced over the scribbling and said, ‘Hey man, this looks pretty good. This could be nice and bluesy if we put something to it,’ which we did. Spend 3 unforgettable nights with us at The Bluestone! Jazz Arts One Night Only at The Bluestone November, 2nd 2018! One Night Only is Jazz Arts Group’s annual fundraiser. This year we will return to the Bluestone for “Blues at the Bluestone” featuring local favorite Sean Carney and Chicago Bluesman Omar Coleman. The Jazz Arts Group of Columbus (JAG) is America’s premier not-for-profit arts organization dedicated to producing, performing and promoting jazz. Our mission is to advance and celebrate the art of jazz through performance and education. The Jazz Arts Group (JAG) divides its resources among two areas: performance and education. JAG Performances include the Swingin’ With The CJO series at the Southern Theatre, JazZoo! At the Columbus Zoo and Aquarium, a contemporary music series at the Lincoln Theater and other venues, and the PBJ & Jazz family jazz series at the Lincoln Ballroom and Topiary Park. The Jazz Arts Group believes in the power of music to transform lives and is committed to offering lifelong-learning opportunities for individuals of all ages, interests, backgrounds and abilities. JAG achieves this with our JAG Education & Community programs and through our Jazz Academy activities. Our Affiliate Musicians program continues to work with area musicians on professional development and performing opportunities for Columbus jazz musicians.